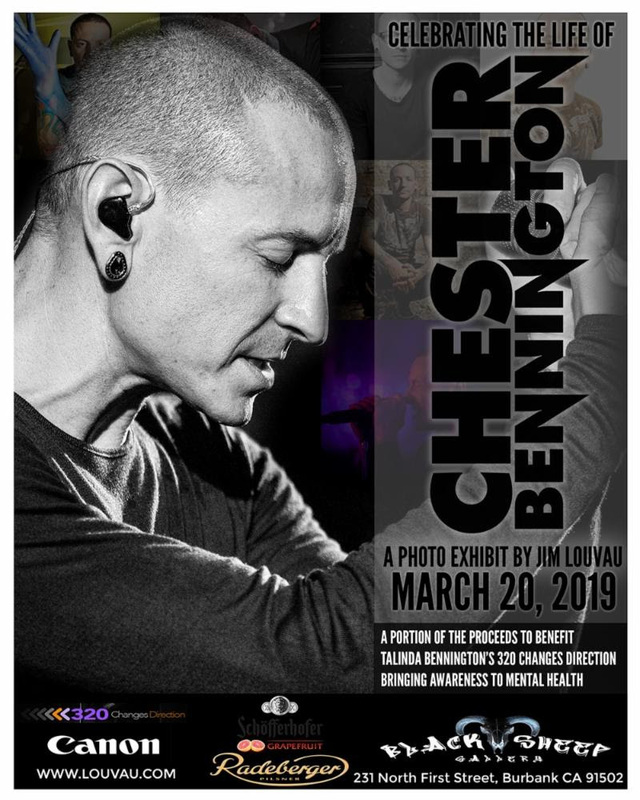 In commemoration of the late CHESTER BENNINGTON-- best known for being the vocalist for multi-platinum rock band Linkin Park-a special photo exhibit will take place on March 20, what would have been his 43rd birthday, atThe Black Sheep Gallery in Burbank, CA featuring never-before-seen photos captured by CHESTER's close friend and artist JIM LOUVAU. The event will take place from 7:00 - 10:00 PM following a private VIP reception for family and friends from 5:00 - 7:00 PM. A limited amount of tickets for the event are on sale now for $25, with a portion of proceeds being donated to his widow, Talinda Bennington's charity for suicide prevention, 320 Changes Direction. Tickets are available for purchase here:https://www.eventbrite.com/e/celebrating-the-life-of-chester-bennington-a-photo-exhibit-by-jim-louvau-tickets-54775251251. "Over the course of our 17-year friendship I was lucky enough to document the evolution of the young musician who never took himself too seriously to the family man and philanthropist he developed into," LOUVAU says. "Now it's time to honor the memory of someone who I owe a great deal of gratitude by sharing the art we created together with the world and continue to celebrate his legacy on his birthday." "I originally met Chester on August 15, 2000, when a previous band of mine played a show with Linkin Park at The Mason Jar. This was a few months before Linkin Park's Hybrid Theory was released. Linkin Park was still a developing band at the time and their booking agent requested that they open for a local act that had a good following. A few days before the show I got a call asking if we'd mind switching slots and letting Linkin Park play last because one of the guys in the band was from Phoenix and his family couldn't get to the show until later in the night. We gladly switched slots with them. That "guy from Phoenix" turned out to be Chester and he watched my band's set and in the middle of our show we broke a snare drum and he was the first guy coming over to help us and let us use theirs." "A few months after that I was performing at a radio show and someone tapped me on the shoulder backstage, it was Chester. He told me how much he loved our show and then he invited me back to his hotel room where we partied all night and really hit it off. He was hilarious and was doing impersonations and telling jokes all throughout the night. A friendship and bond was born that day. As his career skyrocketed we kept in touch and he was always genuinely supportive and curious to what I was up to. I eventually picked up a camera and started exploring my other passion as a photographer in 2007. Chester was the first major artist that allowed me to do a portrait shoot with him and that opened doors for me professionally. Over the course of nearly decade, we continued to work together. I photographed him in children's hospitals, charity events, concerts, and promotional work for Club Tattoo."